Looking a for a natural way to combat allergies, inflammation, high blood pressure, and a range of ailments extending from arthritis to cancer? Quercetin supplements may make all the difference. Quercetin is gaining popularity as a supplement, as an anti-inflammatory, and in athletic endurance and performance products, but what exactly is it? Quercetin is a type of flavonoid, a plant pigment that gives plants and fruits their color, with anti-inflammatory and antioxidant properties. It reduces the production and release of histamine and other allergic and inflammatory mediators. This flavonoid is also a potent antioxidant and may help protect against diseases. Free-Radicals. Flavonoids like quercetin neutralize tiny particles called free-radicals; these particles cause damage to cells, proteins, and DNA, and are linked to aging and a range of diseases, including cancer, heart disease, Alzheimer’s and Parkinson’s. Inflammation. Quercetin also touts anti-inflammatory benefits, important for fighting inflammation in the body – a silent but significant problem affecting many. Of the two types of inflammation that can occur in the body, acute inflammation is associated with injury or surgery. It is short-lived and usually appears within a few minutes or hours following a trauma, characterized by redness, increased heat, swelling, pain, and loss of function. It can be caused by damaged cells, irritants, or pathogens and will typically resolve itself once the cause is removed. When acute inflammation is unresolved, it becomes chronic inflammation, which ultimately causes cellular destruction at the affected site. But chronic inflammation can also occur when internal organs become injured or irritated, a condition called systemic inflammation that has different, less apparent symptoms – the reason it’s called “silent” inflammation. Chronic inflammation can be triggered by stress, bacteria, viruses or parasites, environmental poisons, certain foods, smoking, high blood-insulin levels, obesity and auto-immune response, and if untreated, may lead to conditions like arthritis, heart disease, periodontitis, hay fever, and certain types of cancer. Allergies. Studies have found that quercetin may help prevent immune cells from releasing chemicals called histamines, which cause allergic reactions and symptoms like hives, swelling in the face and lips, runny nose, and itchy, watery eyes. Cholesterol. Quercetin may help prevent damage to LDL cholesterol, the “bad” cholesterol that accumulates in blood vessel walls and causes blockages. Studies have shown that people who eat diets high in flavonoids like quercetin have lower cholesterol levels. And other studies have found that quercetin may reduce LDL cholesterol levels in overweight individuals with high heart disease risk. High Blood Pressure. Quercetin supplementation has been shown to help reduce blood pressure in people with hypertension. Rheumatoid Arthritis/Joint Pain. Research finds that quercetin shows promise in helping reduce pain and inflammation in joints for conditions like rheumatoid arthritis (RA). In addition, other studies have found that people with RA who changed their diets from a typical Western diet to one rich in fruits, vegetables, nuts, seeds, and sprouts (which are high in quercetin and other antioxidants), they saw improvement in their symptoms. Athletic Endurance. Quercetin may also help increase endurance during exercise through its anti-inflammatory properties or by increasing the number and function of cells’ energy-producing organelles known as mitochondria. And it has also been shown to increase VO2 max, a measurement of aerobic fitness that measures the maximum amount of oxygen used during intense exercise. Cancer.Flavonoids like quercetin have long been associated with cancer prevention, and people who eat healthy diets with high amounts of fruits and vegetables are less cancer-prone. And studies have shown that quercetin may help inhibit the growth of cancer cells in the breast, colon, prostate, ovaries, and lungs. To get quercetin from food, the best sources are fruits and vegetables, particularly onions, cranberries, kale, spinach, apple, grapes, broccoli, cabbage, citrus fruits, and parsley. Olive oil, red wine, and dark berries such as cherries, blueberries, and blackberries are also rich in quercetin and other flavonoids. And you can find it in both St. John’s wort and gingko biloba. If you’re looking to harness quercetin’s anti-inflammatory benefits through diet, it’s important to know that the typical American diet – high in refined carbohydrates, added sugars, saturated fat, trans fats, and packaged, processed foods – influences the development of pro-inflammatory compounds. An “anti-inflammatory diet” of mostly fresh fruits and vegetables in a wide variety of colors, little to no red meat, and lots of omega-3-rich foods like salmon, sardines, tuna, and anchovies, can help combat inflammation. Extra virgin olive oil is also beneficial, as it contains monounsaturated fat, antioxidants, and oleocanthal, an inflammation-fighting compound. And so are nuts, legumes, and seeds, which provide omega-9 monounsaturated fats. In addition, eating fiber-rich foods like legumes is important, as fiber can lower C-reactive protein (CRP), a substance in the blood that indicates inflammation. These healthy foods, in conjunction with quercetin-rich foods, may help inhibit the production of pro-inflammatory prostaglandins. While improving your diet is a good way to get more flavonoids like quercetin, the benefits of quercetin are dose-dependent, meaning the effects of the compound change with the dose; therefore, taking a supplement may be much more effective than trying to consume enough quercetin-rich foods. Quercetin supplements are available in pills or capsule form and are often packaged with bromelain, an enzyme found in pineapple, because both have anti-inflammatory properties. There are also water-soluble forms of quercetin available, such as hesperidin-methyl-chalcone (HMC) or quercetin-chalcone. Studies have shown that systemic enzymes for inflammation like bromelain, combined with quercetin, produce greater anti-inflammatory benefits than either one used alone. 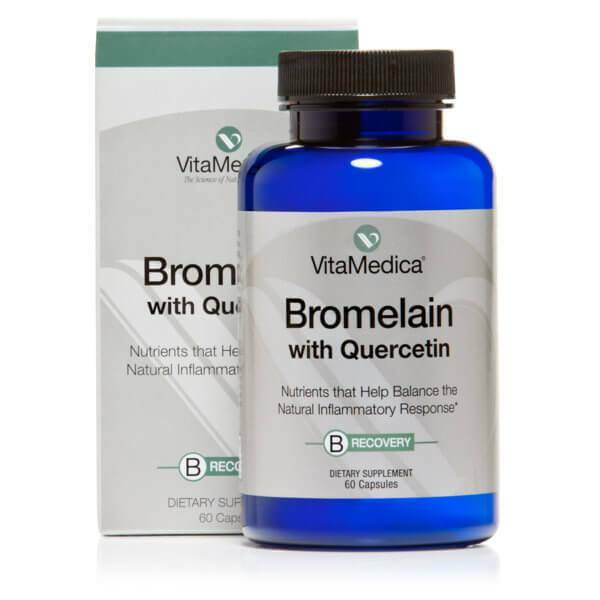 Consequently, the combination of bromelain and quercetin is ideal for effectively inhibiting the inflammatory response in both acute and chronic inflammatory conditions. 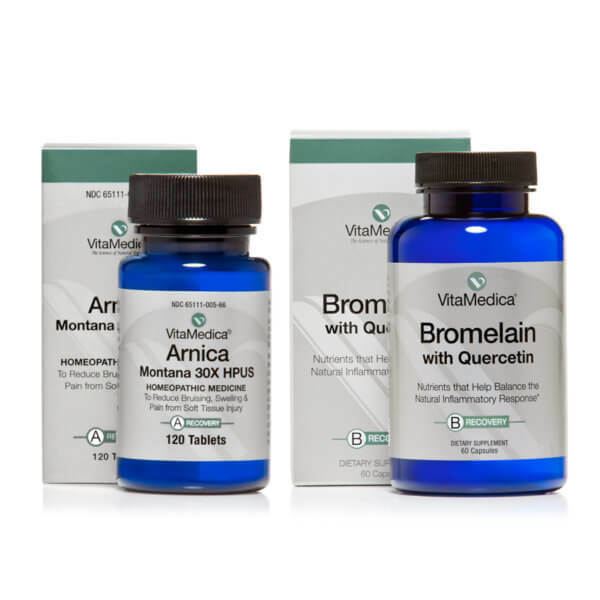 Both bromelain and quercetin supplements are relatively easy to find, but these products are typically sold in combination with other enzymes (e.g., papain, amylase) or antioxidants (vitamin C), and are not as effective in relieving inflammation. Most bromelain-only formulations don’t have a strong enough dose to be an effective anti-inflammatory. Additionally, most of these formulations do not contain quercetin, which works with the bromelain to increase the efficacy of both. Since recommendations call for bromelain and quercetin to be taken together for maximum benefit, formulas that contain both ingredients are ideal. This also simplifies the dosing schedule and reduces the total number of capsules needed throughout the day. For quercetin, dosing is measured in milligrams (mg). 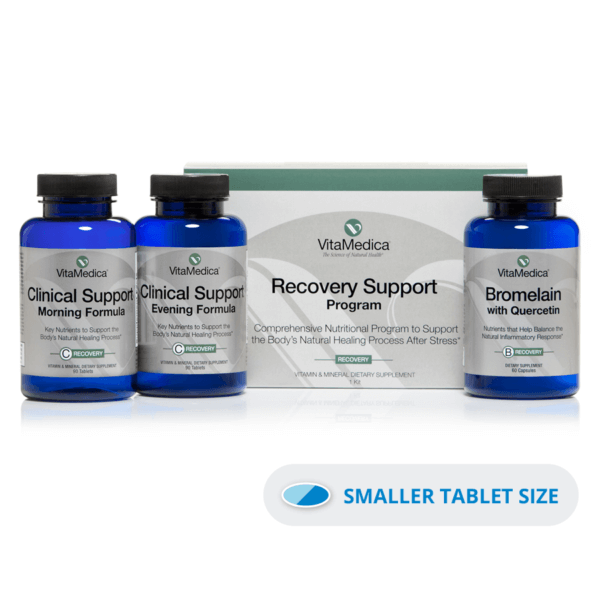 The recommended dosage varies ranging from 500 – 2,500 mg per day, in divided doses. Bromelain is measured by either milk clotting units (MCUs) or gelatin dissolving units (GDUs), so to best measure a bromelain supplement’s efficacy, look for MCUs or GDUs and not milligrams. MCUs and GDUs are used somewhat interchangeably (1 GDU equals 1.5 MCU), and relate to the activity level of the bromelain. Since bromelain is an enzyme, a measure of its strength is how quickly it can breakdown a protein. To be effective, at least 3,000 MCUs of bromelain must be consumed in divided amounts during the course of a day, and it should be taken on an empty stomach to ensure that it works on the site of injury rather than as a digestive aid. While quercetin is generally considered safe, it may present side effects such as headache, upset stomach, and tingling of the extremities. Early evidence suggests that a byproduct of quercetin can lead to a loss of protein function. Very high doses of quercetin may lead to kidney damage, and those taking it should take periodic breaks. Pregnant or nursing women, and people with kidney disease should not take quercetin. And at doses greater than 1 g per day, it may cause kidney damage. Bromelain is also generally considered safe but may cause side effects such as diarrhea and stomach upset. There is also a chance that it may cause allergic reactions, especially in those who are allergic to pineapple, latex, wheat, celery, papain, carrot, fennel, and cypress or grass pollen. Flavonoids like quercetin help play an important role in keeping your body healthy and may be beneficial in preventing inflammation and disease. Ensuring you get enough of this important antioxidant should be a health priority!